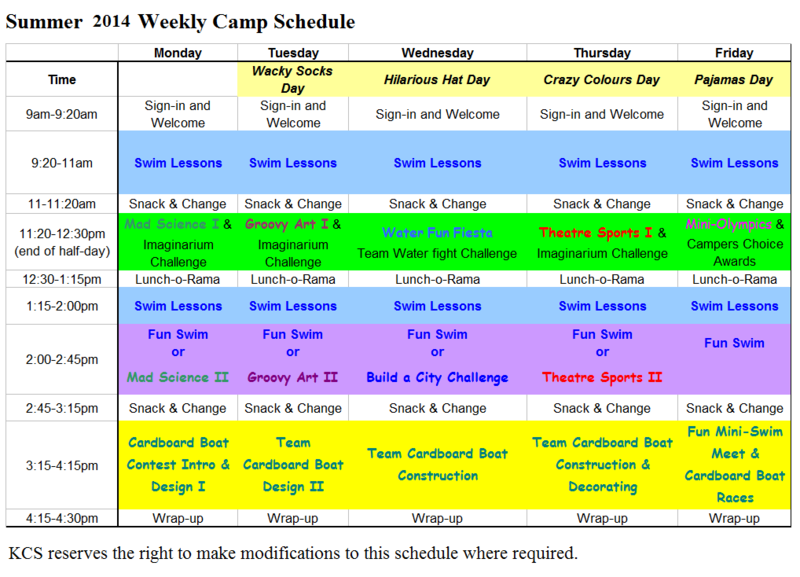 Kamloops Classic Swimming has been offering summer camps for Kamloops families for over 20 years. Our Swim & Play Full and Half-Day Camps include swim lessons that follow the same great SwimSkill Lesson Program that we offer throughout the year. The goal of this camp is to support the improvement of our campers' swim skills & stroke, to instill a "love of water", and to support a fun positive aquatic experience. In addition to three, 45 minute swim lessons per day (full-day program) and free swim time, there are a number of great out-of-water activities to keep our campers super busy. Activities are very diverse to ensure that there is something for every interest. Children will spend the day in a safe, supervised environment, meeting new friends. Check out a sample of our great weekly schedule HERE. Minimum swimming skills: comfortable in deep water - can retrieve an object from 1.5 metre depth from three metres distance, flutter kick on their back, and swim underwater for 3 metres. Club swimmers (Novice or Junior groups) that want to maintain their stroke development and fitness level can also participate. When are the 2019 Camps offered and what is the cost? All sessions are Full Day 9:00 a.m. - 4:30 p.m. or Half Day 9:00 a.m. - 12:30 p.m.
Child Minding will be available 8 a.m. - 9 a.m. and/or 4:30 p.m. - 6 p.m. for Weeks 3 and 5. Child Minding Cost is $15.00 for a.m. (per week) and $20.00 for p.m. (per week). Maximum class size is 6 in Green/Blue levels and 8 in Bronze/Silver/Gold levels. Each camp day starts at 9:00 a.m. sharp! Sunscreen - the camp day starts in the water, so applying sunscreen before drop-off is not necessary. Instead, please have campers pack sunscreen which can be applied before heading outside after getting out of the pool. How do I know what to register my child in? If your child has been involved in Red Cross lessons, the chart below should help you determine which level to register them in. Lifejackets and PFDs are not worn in KCS Swim Lessons. ​Lifesaving Swim Camps are a new initiative from Kamloops Classic Swimming. The camps will offer a number of in-pool and out-of-pool lifesaving activities that will build excitement for our fall Lifesaving Sport Group. In the pool participants will be learning lifesaving swim skills such as the object carry, obstacle swim, line throw, and manikin tow that replicate common lifesaving techniques. Out of the pool they will be learning lifesaving techniques such as choking response, AED usage and for the seniors, CPR. Ages 9-11 will be eligible to participate in the Junior Camp and ages 12-14 in the Senior Camp. Participants must be able to swim 50m in deep water, equivalent to passing SwimSkill Blue level or SwimKids 6. Cost per week is $175.00, 1:00 p.m - 4:30 p.m. daily.